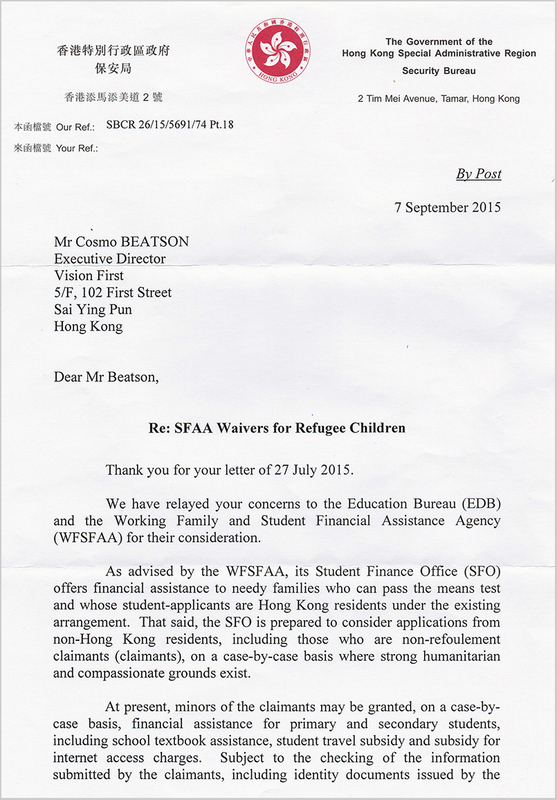 On 27 July 2015, Vision First wrote to the Security Bureau to request wavers of school fees for refugee children. The problem Vision First identified is that school fees are generally met by the government for those families of refugee background that pass the government means test (and of course all refugee families do as they are prevented from lawfully engage in income-generating activities). However, the subsidies are paid several months after these families are required by schools to pay fees and other expenses. Payment requests are reported to sometimes include threats to expel students. The Security Bureau implicitly acknowledges the problem in its reply and from next year payments of financial assistance will be disbursed to refugee families no later than October for primary and secondary schools, and as early as September for kindergartens. In this respect, parents are urged to complete applications promptly and follow up with SFAA directly. This arrangement is not the more practical and efficient waver system offered by the Hospital Authorities for medical fees. However it is certainly better than funds sometimes reaching refugees in January or March of the following year, leaving cash-strapped refugees with the problem of raising money to pay for the compulsory education of their children. It is advisable for ISS-HK and other NGOs to release SFAA funds to refugee parents without delay to minimize financial hardship and possible embarrassing situations. 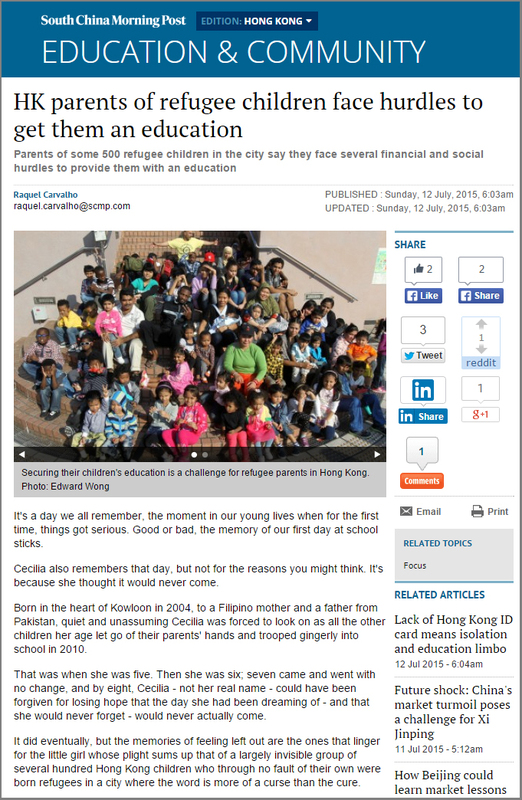 NGOs and good hearted Hong Kong citizens would no longer need to advance money better spent on other purposes if government financial assistance for students were settled directly with the school at the time of enrollment. More advocacy is required on the part of civil society groups concerned with the rights of refugee children. 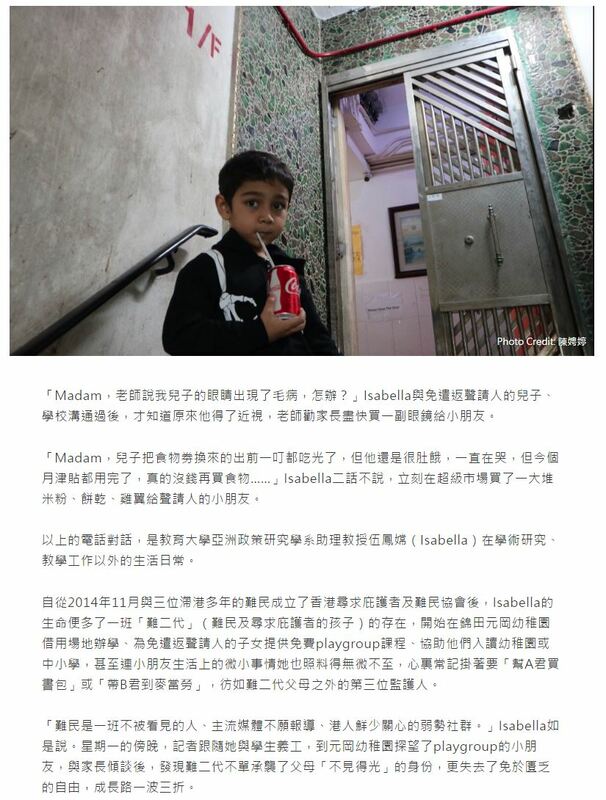 This mother was recognized as a refugee in Hong Kong, which makes no difference in the clash with the bureaucratic mindset of Hong Kong Government. Last year, Abby (not her real name) only had two of three children in school because she was unable to raise enough money. “I home-schooled my youngest daughter because the donor offered only enough for two”. 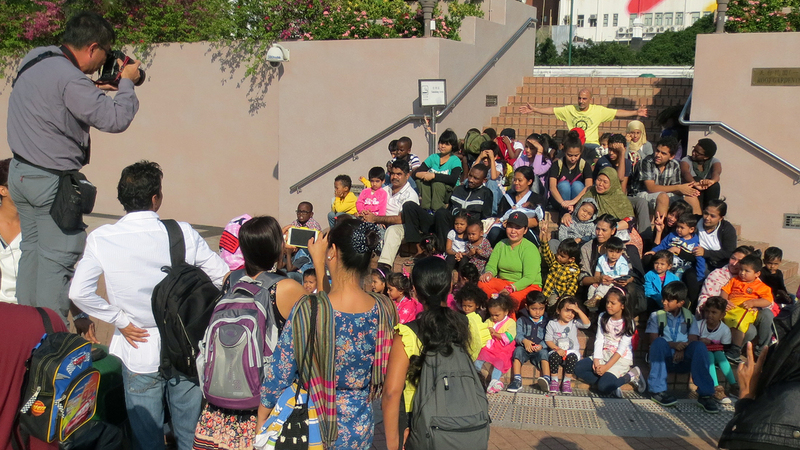 According to a recent report by the South China Morning Post, among 9,940 individuals seeking asylum in Hong Kong, 504 are minors and 269 were born in Hong Kong. While an unknown number is below kindergarten age, the majority must attend nine years of compulsory schooling, six in primary school and three in junior secondary school. 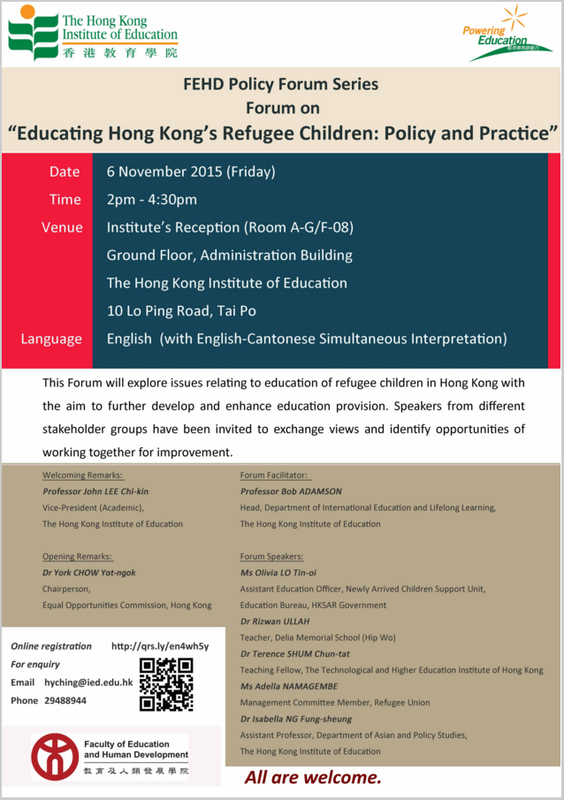 Most also attend 3 years of kindergarten which is essential to learn Cantonese for the higher grades. With pressure to raise money in a hurry, Abby approached the UNHCR for a US$ 1,000 advance to pay for school books, uniform, shoes and enrolment fees required by the primary school. Despite a worldwide annual budget of US$ 5.3 billion, the United Nations refugee agency turned the desperate mother away empty handed. No effort was made to introduce her to a private donor either. Between July and December, refugee parents desperately need to raise money to pay for school costs (including tuition fees for kindergartens) that will be refunded in December or January by the Student Financial Assistance Agency (SFAA). The parents are not begging for donations, but for bridging loans essentially guaranteed by the SFAA, as refunds may be made to donors’ accounts. The reason for this delay is questionable. It is a huge challenge to find donors. The process again raises doubts about policies that influence refugees’ mental health and enforce precarious livelihoods. 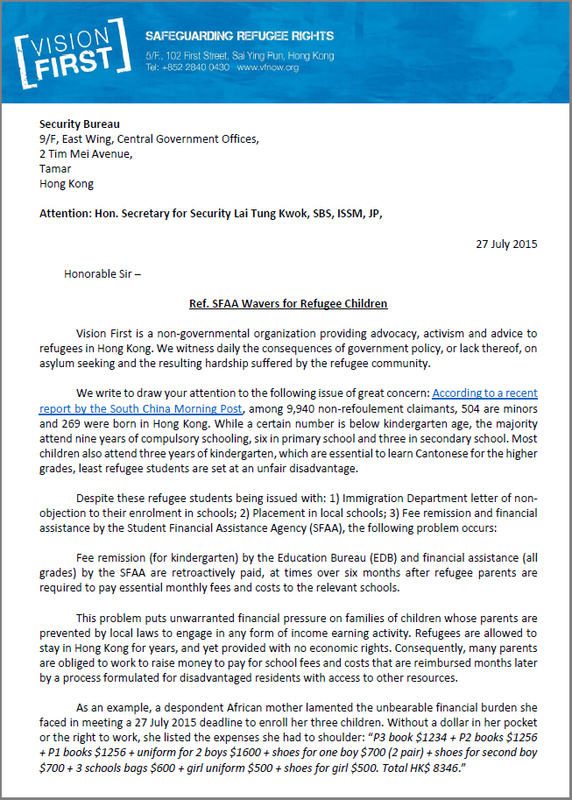 It is indeed unreasonable that the parents of refugee children are subjected to the annual (demeaning) routine of begging for cash to comply with the Education Bureau’s payment policies. Vision First urges the government to have SFAA liaise directly with the school to either release the funds upon enrollment in July, or issue wavers for approved refugee students. Similar arrangements are made by the Hospital Authority that does not require refugee to prepay medical costs. Residents might find it acceptable to collect SFAA grants 4 to 5 months after school starts, but it is unfair for refugee parents who are prohibited from working, receive insufficient welfare assistance and cannot avail themselves of support from wider family, social and charitable networks. 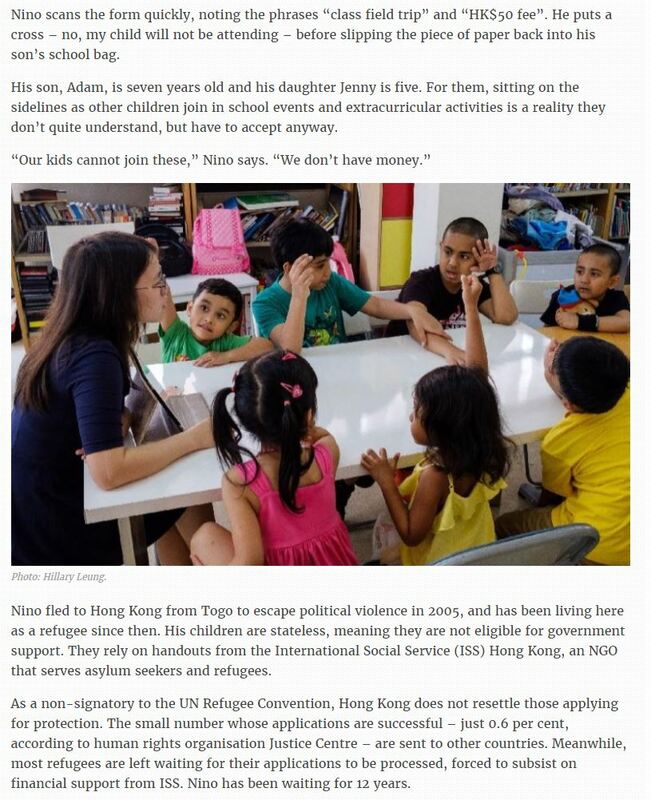 If education is the right of every child, irrespective of immigration status, then Hong Kong Government should refrain from turning it into another deterrent mechanism that “drives refugees crazy”, as Abby put it.